Emma Strother has received the 2015 Samuel C. Lamport Prize for the best thesis on international understanding with an emphasis on cooperation and tolerance. 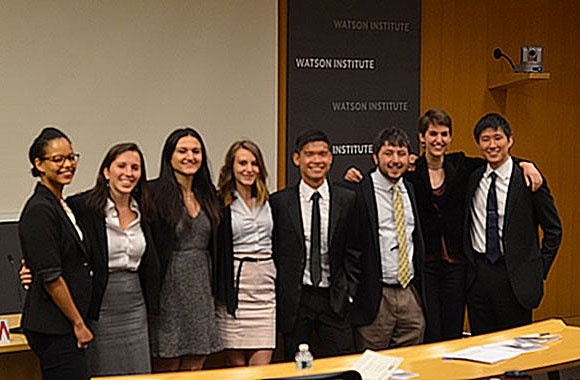 Read the full list of International Relations Program prize recipients here. What is your thesis about? My thesis examines the extent to which political-economic context influences the implementation of public arts programs. Former President of Chile and Brown University Professor at Large Don Ricardo Lagos, and his wife and Former First Lady of Chile Doña Luisa Durán were incredibly generous with their time and moral support as I was researching my thesis. I was able to interview both of them about public arts programs in Chile. This was particularly important because Doña Luisa Durán founded the Fundación de Orquestas Juveniles e Infantiles de Chile (Foundation of Children and Youth Orchestras of Chile) in 2001, which comprised a significant part of the Chilean case in my comparative study. What are your plans after graduation? I have applied for the United States Foreign Service along the Public Diplomacy track, and I plan to take the exam in June. Upon graduation, I will also apply to present my undergraduate international relations honors thesis Political Economy and Global Arts for Social Change: A Comparative Analysis of Youth Orchestras in Venezuela and Chile at the 2016 World Conference of the International Society for Music Education in Glasgow, Scotland.